Another eye-catching miniature to add to your collection! Working with black the basket begins with a crosshatch base in black and a contrasting color. 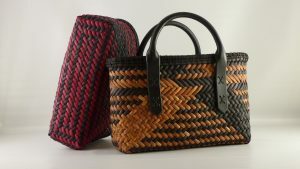 From here the basket transitions into a double walled basket; the inside basket is woven in black and the outside is woven with the contrasting color in a lacy diagonal weave. 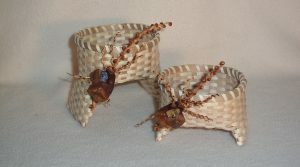 A double lashed double rim tops the basket. 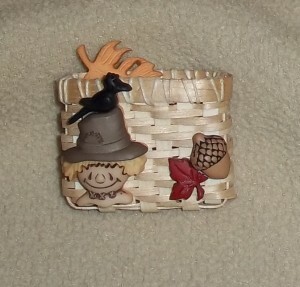 Kit includes materials to make 1 basket (includes mold) in black/orange. 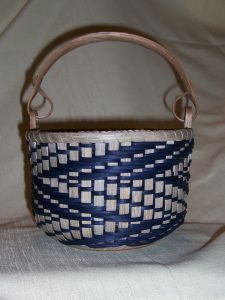 Finished Size of Basket: 1¼” x 1¼” x 1¼ H.
Just the right size for Saturday morning’s farmer’s market! And a fun technique basket: triple twining, wrapping, continuous twill weaving and shaping. Twill options will be encouraged based on the students experience level. 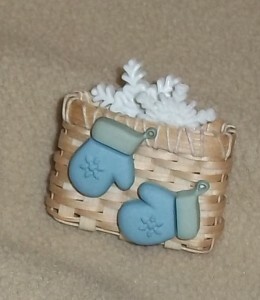 Two hand carved swing handles complete this useful basket. Finished Size of the Basket: 9” x 16” x 7 1/2” high w/o handle. The focus of this miniature is lashing techniques – from chevron base to inside and outside Ti-twining (lattice twining) to rim lashing. The basket is woven completely with black ash and waxed linen, with a touch of sparkly thread to accent your ‘Northern Lights’. Fun to weave, beautiful to display. 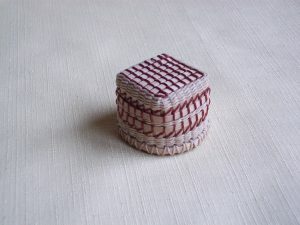 Please note that this miniature basket is woven without a mold. Finished Size of Basket: 1 ¼ ” x 1 ¼ ” x 1¼ H.
A striking yet simple 3/3 twill is woven with a twist, creating a pinwheel design that begins on the base and is carried through on the sides. Students will also learn how to shape a cathead base. A very functional and very attractive bowl shaped basket, perfect for serving. Finished Size of Basket: 12” x 12” x 4” high. This is such a fun basket to weave and stunning to display. 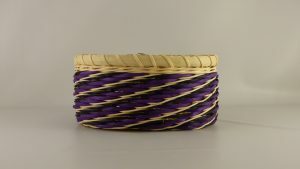 Basket is woven in three colors (natural, black plum and purple) to accent everything from the herringbone base to the overlays. This basket sports two distinct twills as well as two rims. Finished Size of Basket: 12” diameter x 9” H.
This basket requires a gentle touch and serious concentration on shaping. It also includes a lot of fun techniques: a cathead base, lattice twining, continuous weave, three rod waling and four rod waling. 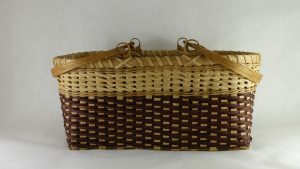 Dyed cane gives an antiqued look to the basket. 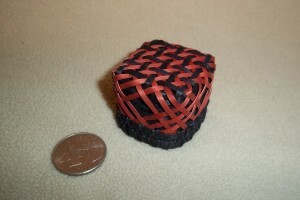 Finished Size of Basket: 5” diameter x 5” H.
This little basket has legs! Weaving with black ash, students will focus on how to control shape, while they weave legs and then transition to weaving a round basket. 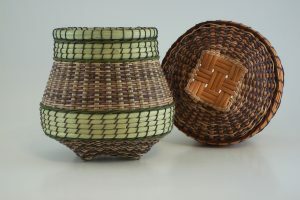 Basket rim is filled with sweet grass, then a simple ‘from nature’ embellishment is added. 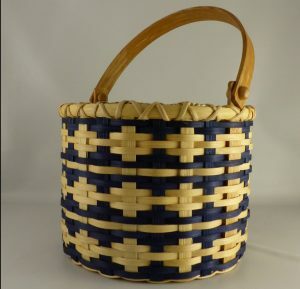 Finished Size of Basket: 3¼” x 3” x 1¾”- 2¾” H.
Creative placement of dyed and natural stakes and weavers and a swing handle create a striking basket. Finished Size of Basket: 8” diameter x 6″ high. Just a fun little gift basket. A woven oval base, a spiral design and a lashed rim. Students will have several color choices. 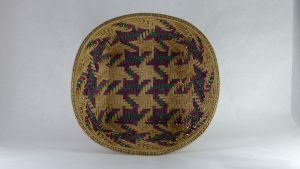 Finished size of Basket: 5 1/4” x 7” x 3 1/2” H.
A striking cathead basket. The base is a woven two color 2/2 twill (herringbone), as you weave up the sides we will change the twill to 3/3 to accentuate the dyed and natural spokes. Three Ti-Twining rows are a focal point of the basket. 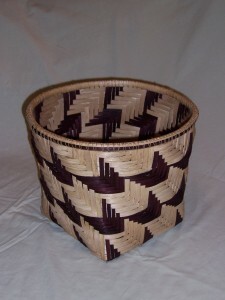 Finished size of Basket: 13” diameter x 8” H.
A classic basket shape with a striking design; a 3/1 twill jazzed up with reversals and arrows. The pattern includes a detailed graph to help you weave this unique twill pattern. 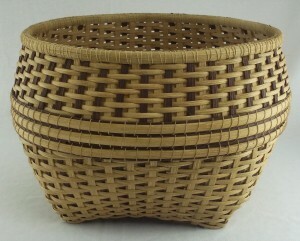 An oak base begins the basket and pigtail handle completes the basket. Finished Size of Basket: 8″ diameter x 6″ high. This fun little lapel pin is woven on a mold with black ash and lashed with waxed linen. The basket is woven continuously with a simple 2/1 twill and embellished with fun season themed buttons. Each kit includes materials (including a mold) to make two (2) pins. 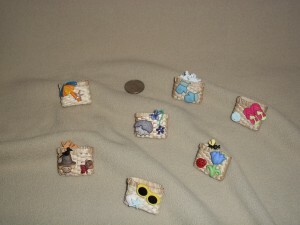 Button embellishments will be chosen at random. If you want embellishments to reflect a season or event please indicate this on your order, we will do our best to enclose embellishments that reflect your request. 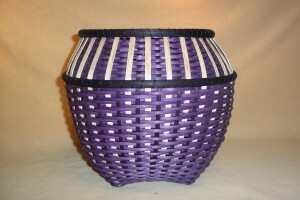 Finished Size of Basket: 1¼” x ½ ” x 1″H. If you have worked with bias weave and are ready for the next challenge, this little tote is for you.The pattern has easy to use graphs for weaving the base and has multiple clear photographs to assist well written instructions. The kit includes dyed Hamburg cane and two beautiful round rein handles. Finished Size of Basket: 9 ¾” x 5” x 6” H. Weaving Level: Advanced. Patterns are available for all of these baskets and more in my pattern store just click here.